One of the demos that I really enjoyed at Ricky Tim's program in Rochester, NY a few weeks ago was of mitered, piped bindings. Ricky strongly suggests that one use #3 Pearle Cotton when you first experiment with these bindings. It took a bit of searching to find some #3 Pearle but I finally located some at the Stony Creek website. So, I spent some time last week playing with the technique with the extra motivation of two art quilts in need of binding. I hoped to submit entries for two exhibits using those quilts in the next few weeks so pressure was on to learn the technique if I wanted mitered piped bindings on those pieces. Ricky did an excellent demo during his program and I took notes --- but that was over two weeks ago. Fortunately, he also provided a detailed workbook with plenty of photos. I needed that! The opening stages of creating the binding was fairly simple: cut some fabric in strips, press, insert pearle cotton to create piping and attach to binding fabric. 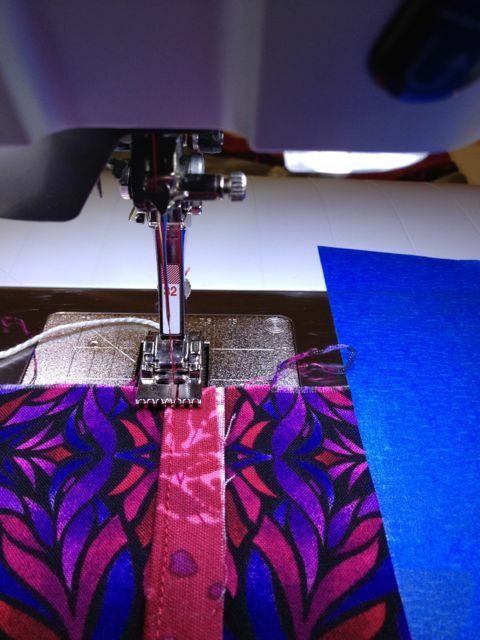 I got a chance to use my brand new #32 seven groove Bernina pintucking foot for this part. At this point, things got a bit more complicated - even with photos. 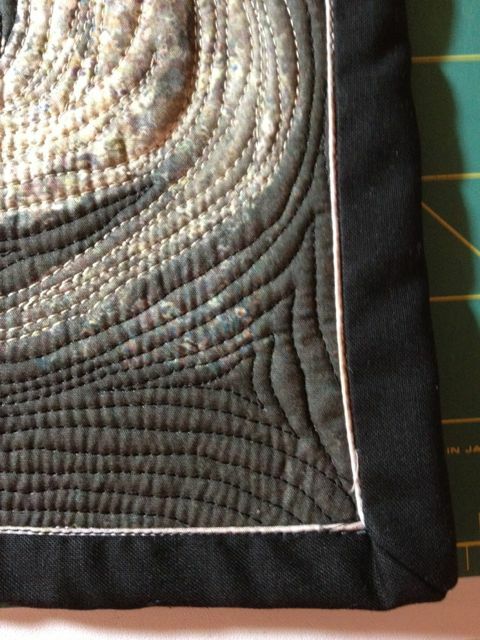 In attaching the binding to the quilt, one starts with the mitered corners. I have done many mitered corners and thought I understood Ricky's demo fairly well. But, did I mention that this binding requires no hand sewing as you machine stitch the whole thing? 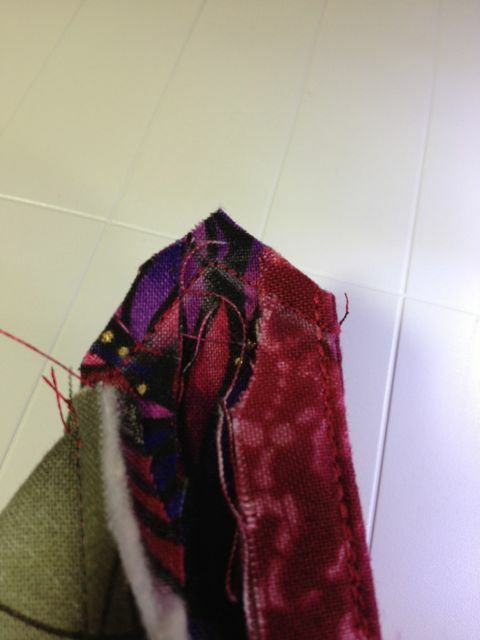 That means that you are mitering a piece of fabric that is both the front and back of the corner. This was new to me. The photos didn't really help. 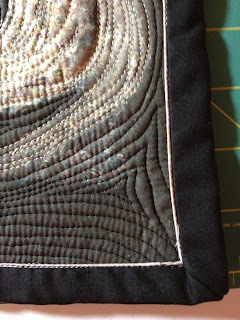 Fortunately, I had the wisdom to not try my first mitered piped binding corner on a quilt I hoped to have in an exhibition. 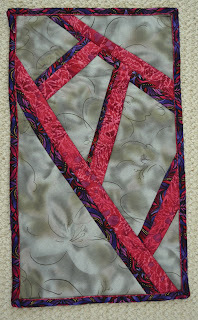 I had a challenge piece for Jeanne Simpson's Quilt 2012 that needed to be bound. And, as I have mentioned before on this blog, Jeanne's challenge is to create 'sketches' that should be experimental in nature, approached intuitively and completed quickly. So, my corners on this week's Broken Ladders challenge were definitely experimental! The first one was totally wrong. I mitered as though I was doing a one-sided quilt border. Well, I quickly figured out that was incorrect. I kept experimenting and finally figured out enough to get the proper angle for the corner. 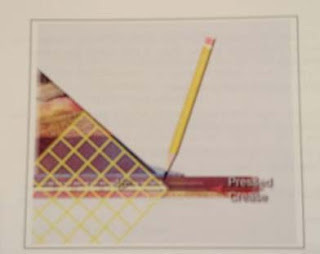 I then spent the remaining corners 'refining' my technique. Finally, I came up with an innovative approach that we won't discuss to 'correct' my first corner so I could send Jeanne a finished challenge piece with 4 mitered corners. By the time I had worked through the four corners in the Broken Ladder piece, my confidence was improving. I was able to pipe and miter the first of my two unbound art quilts fairly successfully. Here is one of the corners. Needless to say, I am extremely grateful that our Quilt Guild brought Ricky to Rochester and that I was able to attend. I expect that this will become a favored binding technique for me from now on!